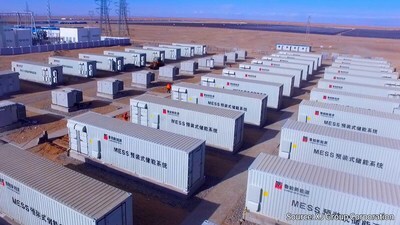 GOLMUD, China, Jan. 30, 2019 /PRNewswire/ -- Contemporary Amperex Technology Co., Limited (CATL), a China-based manufacturer of lithium-ion batteries, has delivered world's first and China's largest battery energy storage system (BESS) multi-mixed energy power station ("the Station") as part of the Luneng Haixi Multi-mixed Energy Demonstration Project ("the Project"), which is the first of its kind in China to integrate wind (400MW), photovoltaic (200MW), concentrated solar power (50MW), and an energy storage system (ESS) (100MWh) into one unified system on the grid. The Station coordinates three different renewable, with fluctuating and particularly unstable, sources of energy and is required to respond consistently to fluctuating demand, making its batteries and battery management system crucial to the reliability of the system. CATL, the exclusive battery supplier for the Project, overcome the requirements during product design and development stage and took merely 17 days to test and commission the BESS to the grid. Huang Shilin, Vice Chairman and Chief Strategy Officer of CATL, said, "The Station is the first of its kind - a multi-functional, centralized power plant integrated with an electrochemical energy storage system. Its technical reliability and affordability will promote further global deployment of different renewable energy applications." The first priority when building an energy storage station is safety. By selecting reliable materials, CATL minimize the possibility of failure incident and second damage explosion. CATL also follows the Potential Failure Mode and Effects Analysis(FMEA) design process to identify risks and execute risk mitigation plans in early stages of product development, manufacturing and management to ensure safe operation of the battery system with well-designed battery cell, module, cabinet and control system. Utilizing a three-layer relay protection system, CATL further assures performance of the battery system from damages caused by over-charging/discharging, over-current, mitigate over and under temperature working conditions. One of the key challenges of safety and performances that CATL and the industry face is thermal management. The Station, installed at Golmud where temperature varies from -33.6 to 35.5 degrees Celsius. To ensure 15 years of battery performance, CATL has deployed a cooling system that uses air passages and air flow designs to maintain a consistent cabinet temperature. A battery management unit will kick-in the battery cooling system as soon as it detects thermo concerns, while pre-stored electricity protects the battery from capacity loss or lithium plating caused by charging in cold temperatures. In addition, the Project has tough structural requirements, as Golmud lies in an active seismic zone, which calls for vibration and shock absorption. CATL's state of the art Test & Validation Center carried out rigorous testing and simulation to prove its batteries are able to withstand a potential earthquake of magnitude 8. According to Dr. Hui Dong, Chief Scientist of China Electric Power Research Institute, the Station is "the World's first and China's largest electromechanical energy storage station with virtual synchronous generator." With the Station as an important part and an expected annual electricity generation amount of 126,250MWh (401,500 tons of coal generated energy), the Project is expected to be a good showcase of different new energy applications, thereby setting standards and smart grid applications around the world.